To keep the clients satisfied, we trade and supply high quality Dicyandiamide that is used as slow fertilizer and fuel in slow explosive. The chemical provided by us is processed by making use of excellent grade chemical compounds and innovative technology at vendors' end. Offered chemical is colourless that is highly soluble in water, acetone and alcohol. 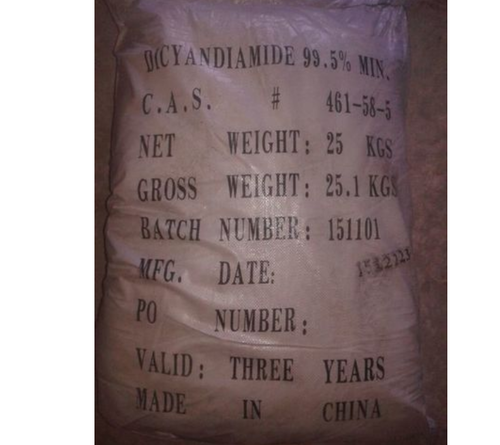 Apart from this, clients can obtained this qualitative Dicyandiamide from us in different air tight packing at industry leading rates within promised time-frame. Strengthened by a wide sales and distribution network, we, Swastik Chem Impex, are efficiently meeting the requirements of our large customer base. Established in the year 2003, we are envisioned to scale to the phenomenal heights of success in the trading domain. Since our inception, we have been following customer oriented approach in all our operations. This has enabled us to earn tremendous reputation and goodwill. We value our clients' needs and always strive to provide them with the best quality chemicals in the minimum lead time. Today, we are known as one of the prominent importers, traders and suppliers of the industry. We are offering a superlative range of Sodium Tripolyphosphate, Hydrazine Hydrate, Polyvinyl Alcohol, Sodium Hexametaphosphate, and more. Our procurement personnel carefully source the products and make sure that the entire assortment is free from defects. Our team keeps in touch with the vendors as well as ascertains that they carry out all the production processes with utmost care. Moreover, the personnel also ensure that the products delivered to us are manufactured and packed in accordance to the upcoming industry standards.